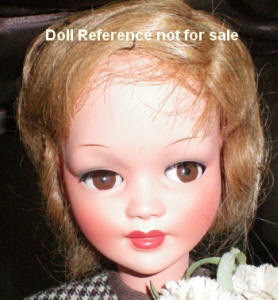 1950s Ottolini doll is 13" tall, hard plastic jointed body, sleep eyes, closed mouth, glued on wig possibly human hair, doll is unmarked. Not much information has been found about the Italian doll maker Carlos Ottolini, who made hard plastic and vinyl headed dolls from the 1950s on. 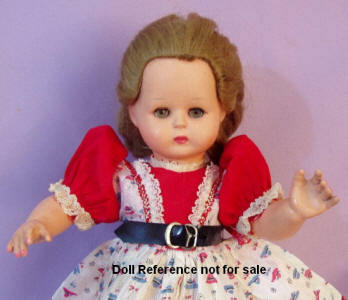 Many of Ottolini's early dolls seem to be unmarked, however they have very distinctive Italian face molds and the face paint of the dolls lips are often similar. ca. 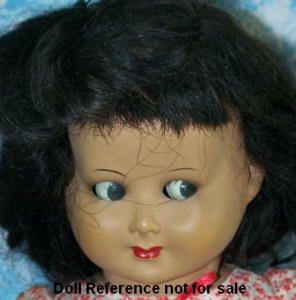 1950s Ottolini doll is 18" tall, all light weight hard plastic, jointed body, flirty sleep eyes that move side to side, closed mouth glued on wig. ca. 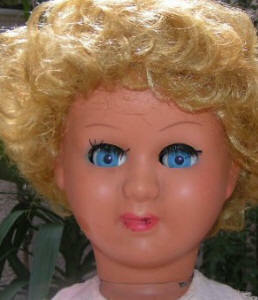 late 1950s Ottolini doll is 27" tall, all light weight hard plastic, jointed body, sleep eyes, real long upper lashes, closed mouth, glued on synthetic short curly wig. ca. late 1950s-1960s Ottolini Sonja doll is 25" tall, hard plastic jointed body, vinyl head with human hair wig, sleep eyes with real upper lashes, closed painted mouth, painted molded high heeled shoes. Ottolini C & D MOD. DEP. Made in Italy. Ottolini Ellen doll, a high heel fashion doll 15" tall, similar to Bild Lilli or Louis Marx Miss Seventeen doll, painted eyes, glued on wig, closed painted mouth, strung doll, painted molded high heel shoes.